The big and beautiful Brooklyn Creative League hosts this group show of paintings and collages. 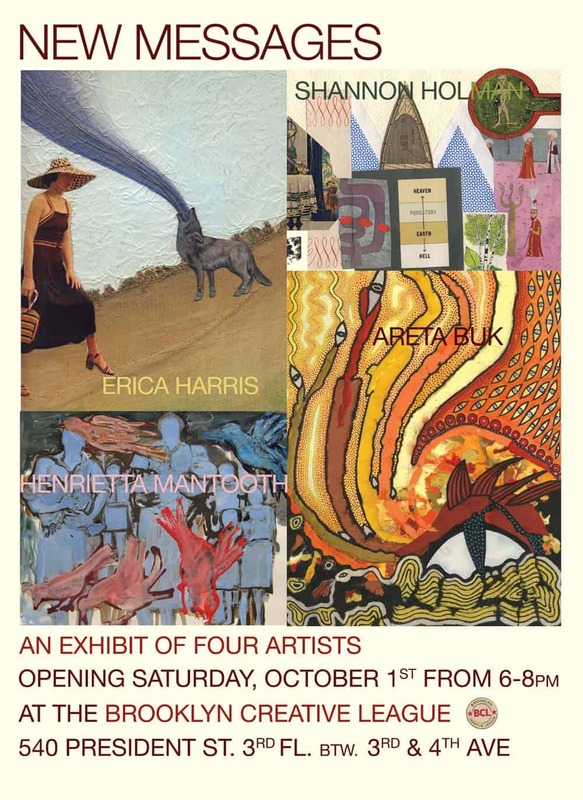 Opens this Saturday, Oct. 1 at 6pm and runs through February. My painting can be described as “witnessing”. The work is often based on images and stories in the news, people who look out at us every day from the printed page and television screen but who are usually nameless — refugees, rebels, farmers, men and women who tend and defend their land, homes, children, animals and ideas. My intention is that they speak out from the paintings: “HERE WE ARE”. I lived in Latin America for 18 years, learned Spanish and Portuguese, traveling to out of way places: Indian settlements and ancient ruins, Baroque villages and areas where Afro culture and rituals flourish, in Brazil, Venezuela, Mexico, Peru, Colombia, Argentina, Bolivia and Guatemala. I accompanied rustic pilgrimages where people rode for days in the back of trucks, on horse and mule back and in ox carts in biblical fashion to make offerings, sell their wares and livestock, buy salt and other supplies, marry and baptize their children in group ceremonies. Painting is about bravery. For both artist and viewer. Art is emergency both in the sense of urgency and coming forth. Accept the unexpected and the surprise of the accidental and choose discovery over perfection every time. Rely on your hand to know what it is doing and respect your own process. It will be different from everyone else’s. This is my advice to myself.